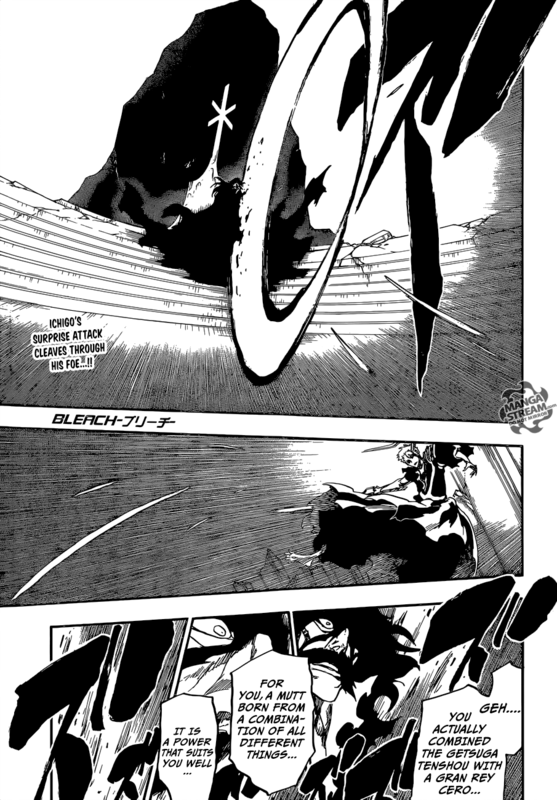 Ichigo’s attack lands against’s Yhwach. He calls Ichigo a “mutt,” for his combination of Gran Ray Cero (Hollow) and Getsuga Tenshou (Shinigami). 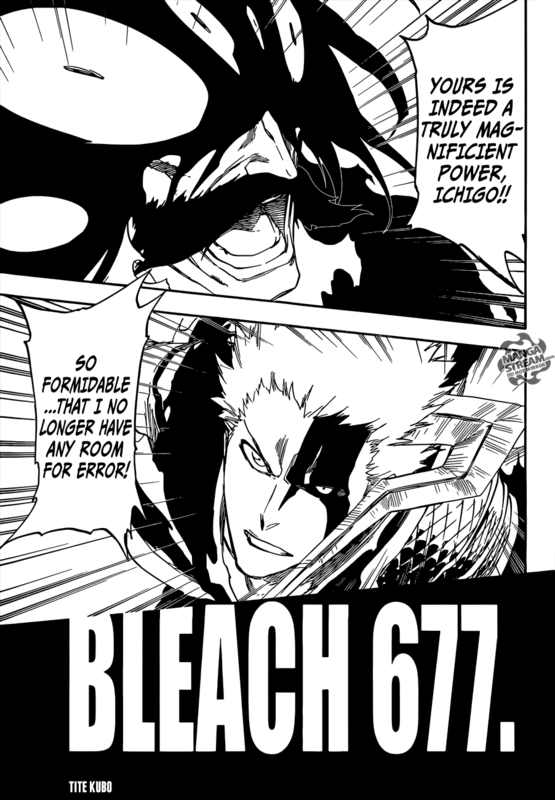 He’s says this power “suits” Ichigo well. However, he seems to be unimpressed by this power. Ichigo realizes that he’s being underestimated. He concludes that this is his chance to strike. He explains in his ability further. He says that “the future diverges in countless directions from a given point in time like grains of sand in the wind and that there are as many possibilities as there are grains of sand before stating that changing the future is as simple as moving from one grain of sand to the next. 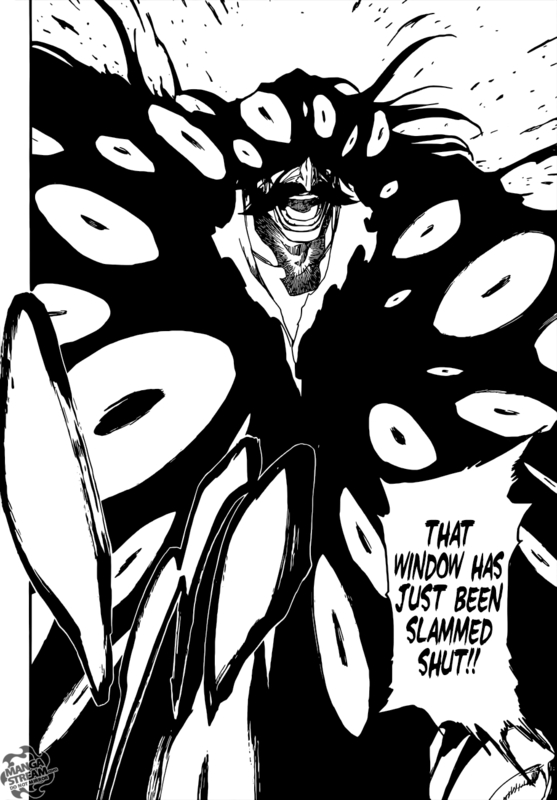 Declaring that he can see all the grains of sand from where he stands, Yhwach tells Ichigo to keep pushing forward and moving between grains of sand without despairing.” Ichigo with his back against the wall, uses Bankai. I feel like this fight has been accelerated. Not much has happened in the last few chapters. For Ichigo to use Bankai so quickly is daunting. Kubo probably will shift to the other fights currently going on, before concluding this one. As I mentioned before there are still several characters still alive to help Ichigo. He clearly needs aid. That said I’m excited to see what his Bankai looks like. 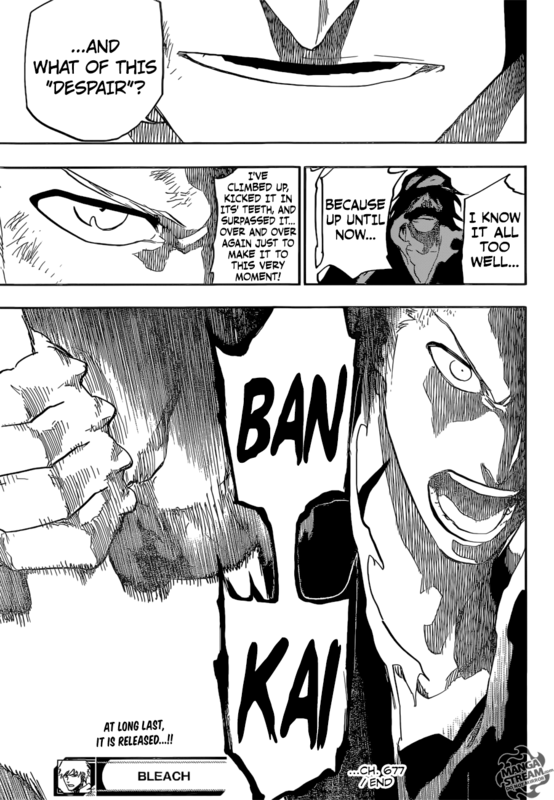 I always found that his previous Bankai wasn’t interesting, hopefully this one will be better. All Might successfully lands a punch on All for One. The punch he delivered was designed to lower All for One’s guard. 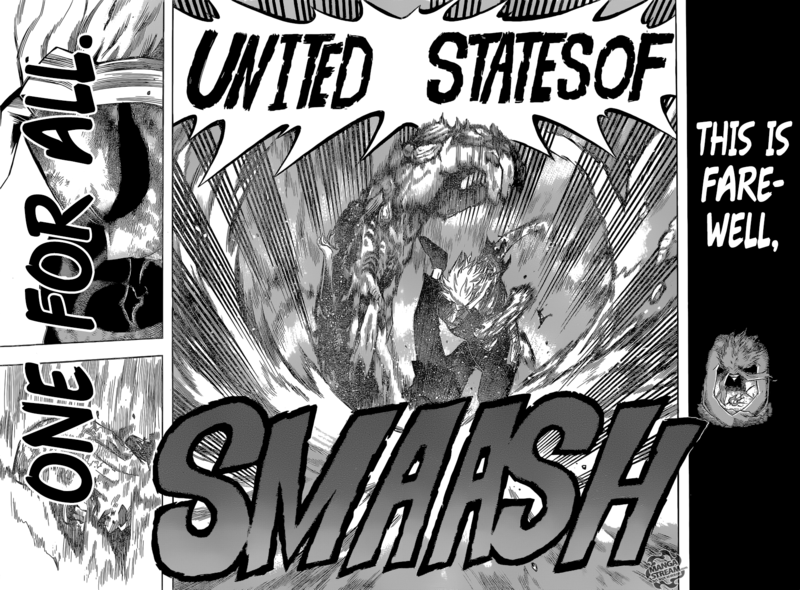 All Might use “United States of Smash,” on All for One. All for One is defeated, unconscious in a crater. Might raises his arm in triumph. His victory is announced, transforming into his “Hero” form to symbolize peace. 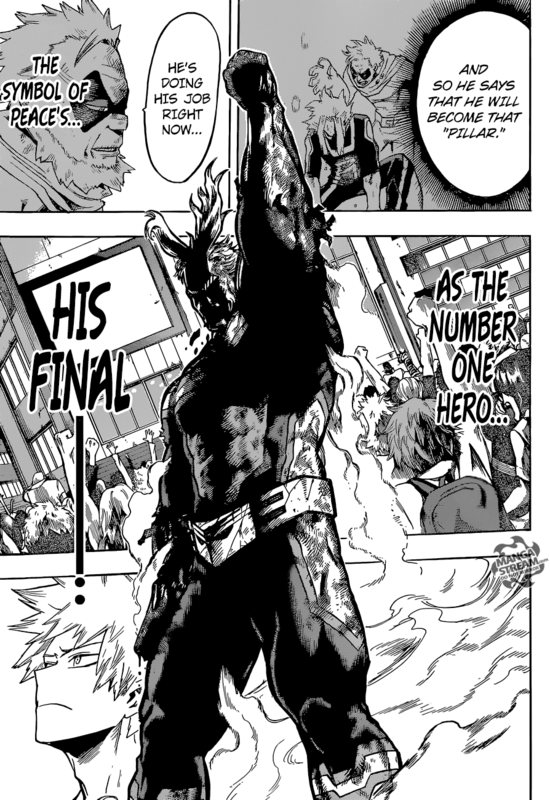 While All Might was fighting, the other Heroes were saving as many civilians as possible from under the rubble. All for One is imprisoned and All Might points to the camera. He says “You’re Next,” causing the civilians to celebrate. 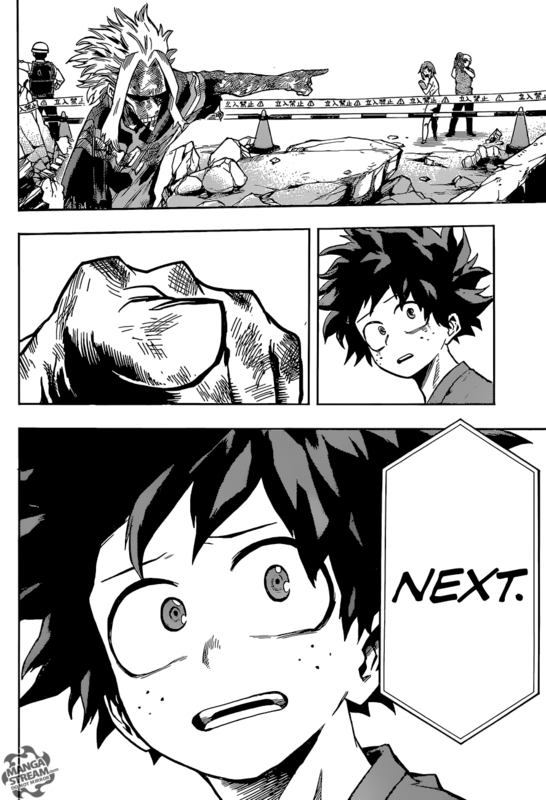 Izuku knows the true meaning of that message. That his time to replace All Might will be coming. He begins to cry. All for One is incarcerated in a prison where “the death penalty is not enough.” All for One is unsure of his location. He reveals to the guard that he can “see” using an infrared quirk. The prison guard is impressed that he was able to fight in his condition. All for One is actually happy that he was defeated. He believe’s that his defeat will inspire Tomura’s hatred and he will become stronger.